The communities of Mayerthorpe and Whitecourt were devastated by the deaths of four RCMP Constables, March 3, 2005. In the midst of the grief and shock the citizens of each community conducted themselves with dignity and respect and showed the world the pride rural communities have in their RCMP. In May of 2005 the Mayerthorpe Fallen Four Memorial Society was formed. The society members wanted to create a monument to honor the risks that all police officers take every day to ensure the safety of our communities and citizens. In particular, they want to recognize the ultimate sacrifice that Constables Peter Schiemann, Leo Johnston, Anthony Gordon and Brock Myrol made. This was a very sad and painful moment in the history of our country, and the society hopes to create a fitting tribute to these fine officers. A 6 acre site has been chosen for the memorial, and construction is underway. At the heart of the Fallen Four Memorial Park will be the life size bronze statues of the four officers. These original bronze works are designed and created by artist Don Begg of Studio West Bronze Foundry and Art Gallery, at Canada's largest sculpture foundry. As part of their fundraising efforts the Society has commissioned artist Don Begg to create 50 limited edition bronze statuettes in commemoration of the fallen officers. Don Begg, together with his wife Shirley, run Studio West Ltd. Born in Cochrane, Alberta, Don studied sculpture and bronze casting in Alberta, New York and California. Don's bronze sculptures depicting wildlife, historic figures, western scenes and the oil and gas industry have received awards and high recognition in Canada and the US. 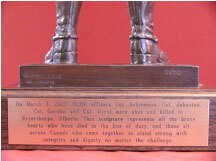 "On Guard" was designed and sculpted by Don Begg and depicts an RCMP Officer in serge with setson and high boots standing at ease. The finish, a warm brown patina, was chosen to enhance the life and vitality of the statue. The statue stands 16.75” high and is situated on a 2” walnut base complete with brass description plate. The statue is a limited edition of 50 and each comes with a Certificate of Authenticity. Some of the more than 20 statues cast at Studio West include: Wayne Gretzky, 12 foot tall Sitting Eagle, Brigadier General Andrew Hamilton Gault, Lester B. Pearson, John Diefenbaker and the Bullwhacker. Studio West Bronze Foundry & Art Gallery is located in Cochrane, Alberta.